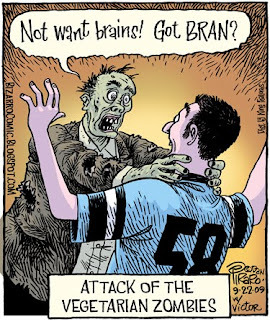 Bizarro is brought to you today by King of the Brain-Eating Zombies. Followers of this blog may know that I have had a relationship with a teenage boy for a few years now. But before you go "tweeting" that, let me say that this relationship is not illicit, illegal or inappropriate in any way. He's just a funny kid who sends me cartoon ideas from time to time. His name is Victor or Vance or something, I can never remember, and he just started college somewhere on the East Coast. Or maybe Canada. I've posted about him before and even included some pics of him and his family visiting Bizarro International Headquarters in Brooklyn earlier this year. They cry out for "grains"
It's funny because it's true. Or at least I assume it is true. I'm a vegan but not a zombie, so I can only be half sure. Dan: Glenn Beck shares the title of "Zombie King" with Michael Moore and Rush Limbaugh. This Victor guy is a genius!! In the family portrait, I am the one in blue. (Dig the 'stash. Quite groovy on a chicky-poo).